Our youngest son, Brad, and his family live in the city, about 55 miles away from the rest of us. Every now and then, Brad and Jennifer invite the whole bunch of us over for a visit. The Saturday before Father’s Day was such an occasion! I didn’t get a picture of all of us together, but I did manage to snap a few others, which I will share. We all drove separately and met up at Brad’s house. Of course, being the ‘old farts’ we are, Ed and I arrived first. Once the others got there, we feasted on a delicious lunch of grilled hamburgers and hot dogs. For dessert we had two delicious ‘Cheese Cake’ choices, both of which were made by Brad. I’d love to show you ‘the tool’ Brad used to ‘whip up’ his desserts, but I promised I wouldn’t! I didn’t promise to tell what it was though. Keep in the back of your mind that Jennifer has a beautiful red Kitchen Aid mixer in her kitchen–but picture in your mind, Brad using a whisking tool attached to the end of his red cordless drill… Why? I do not know, but it worked, and that’s what really matters! After lunch, baby Evan needed a little nap, and, apparently, so did a few of the adults. 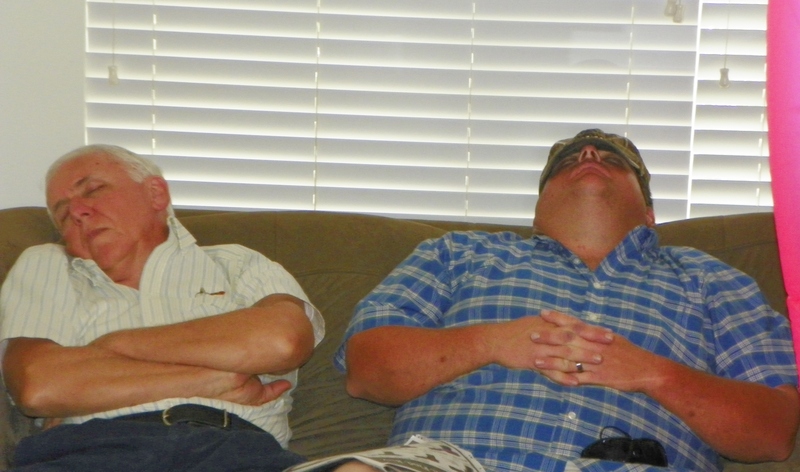 You know what they say about reverting back to childhood with age… These two took their naps on the couch! 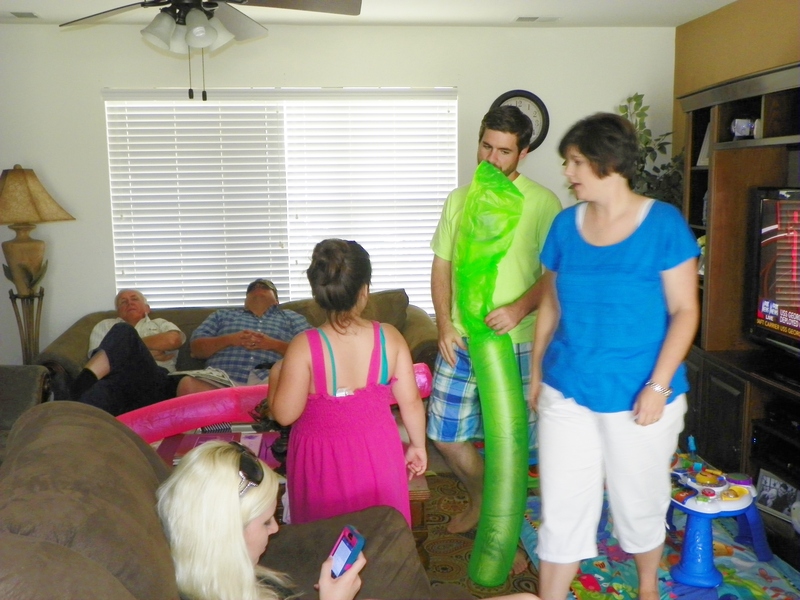 While some folks took naps, others blew up floats and got dressed for swimming. Jennifer checked out what was happening on Facebook. I sat and watched the flurry of activities, which made me tired, just doing so! I’ve become a big fan of ‘naps’, and probably could have used one myself! Instead, I stretched out on the floor, behind the love seat (which isn’t pictured). Unfortunately, I didn’t get to stay stretched out for very long because I was in everyone’s way! Finally, all of the ‘nappers’ woke up, and it was time to head for the swimming pool. It’s too far to walk to the pool, so we had to take four different cars to get there. Again, being the ‘old farts’ that we are, Ed and I left the house first, just to get out of everybody else’s way. 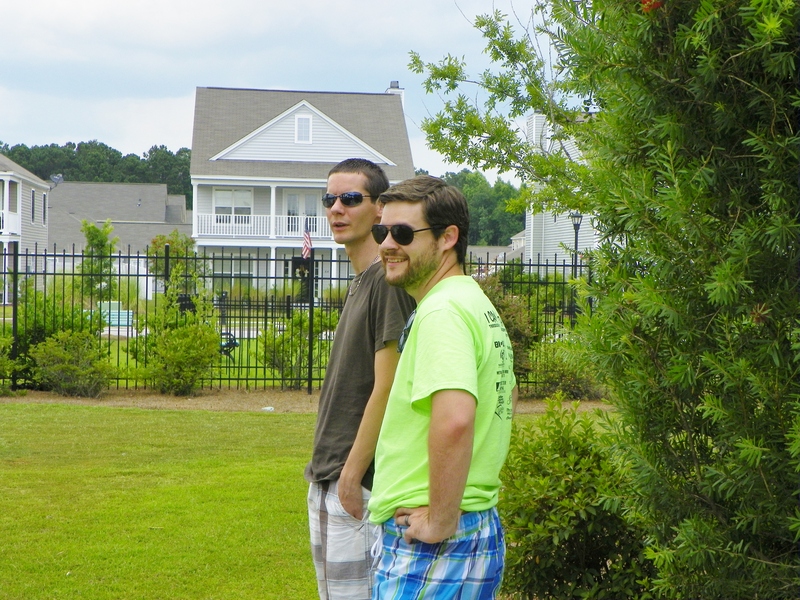 We politely waited at the pool, in the car, until Brad got there with the key to the gate. While waiting, Ed and I noticed a couple of very skinny boys sneaking through a hole in the fence, illegally gaining access to the neighborhood pool. If this wasn’t bad enough, once inside, they unlocked the gate, and let in several more of their buddies, too! The pool was very crowded that day, which made me wonder just how many ‘buddies’ those skinny boys had! Now, Ed and I don’t ‘do’ swimming pools anymore, nor do we care about sitting around in the sun like the young folks do. I don’t think either of us have worn a swim suit since 2009–and I’m sure the general public thanks us for that! We managed to find ourselves a couple of chairs under a nearby shelter, and tried to make ourselves comfortable–but it sure was hot. Now, Ed and I are used to the heat, but there’s a difference in working in the heat and just sitting in the heat! 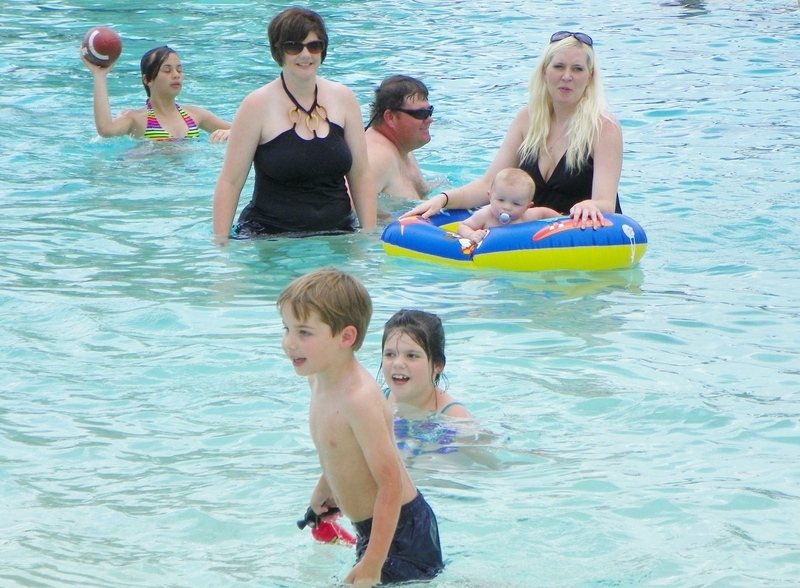 We watched the grandchildren swim for a bit, then ultimately decided we’d load up and head on back home. Country life was beckoning us! It was just as well, because about the time we were getting ready to leave, the sun went under, and an afternoon thunder shower blew up. It began to sprinkle while we were saying our goodbyes! The others stayed on a while longer. Some eventually left to go shopping, while others went out for supper. As for Ed and me? We arrived back home in time to get a few things done around the house! Brad and Jennifer? They repeated the whole scenario, the following day, when they invited her entire family over for lunch! Everyone enjoyed their visit to Brad and Jennifer’s house, and we appreciated them having our entire crew over for a visit. I know, from experience, how much work this can be! It was a nice change, not to have to be in charge of anything–including cooking and clean up 🙂 I hope they’ll invite us over again sometime soon! Sounds like you all had a wonderful visit … a nice change of pace for you, I’m sure. I’m still smiling at the notion of you stretched out on the floor behind the love seat. My dad had a saying for reverting back to childhood – “Once a man, twice a child.” Interesting isn’t it that it’s MAN! What a great time!! Love the photos. Your two boys are quite handsome! You are right about it being a lot of work to have folks over, but the fun, love and memories are so worth it! Sounds like a perfect day! So glad you got to spend the day with family. I love pictures of people napping………….